Migrants line up after arriving at a train station in Vienna, Sept. 12, 2015. Half a million migrants and refugees are known to have entered the European Union during the first eight months of 2015. That number may increase to more than one million before the year is through. The figure does not include individuals who got into the EU undetected. Germany is a destination of choice for most migrants, attracted by the generous benefits they can claim and the government’s message that refugees are welcome. The current refugee and migrant crisis on Europe’s doorstep is a daunting challenge, said Annette Heuser, executive director of the Washington-based Bertelsmann Foundation, in a VOA interview. Heuser admits Europe neglected the mounting migration crises for too long while preoccupied with its own financial crisis and Greek debt negotiations. “And right now, we are definitely not prepared to deal with the huge amount of refugees that are ending up not only on our borders, but in our countries every day now… This has to be addressed immediately on the level of heads of states, because if we don’t solve the crisis, then it will create a lot of turmoil within the European Union,” said Heuser. Once more, the rest of Europe expects German Chancellor Angela Merkel to take the lead, said Heuser. Chancellor Merkel is calling for a unified, coordinated European system for handling migrants and asylum seekers — and for generosity, said Heuser. Germany plans to do its part, she adds. By the end of this year, Germany will take in 800,000 refugees and for the next five years, half-a-million refugees annually. Heuser contends that despite formidable difficulties, Europe’s present crisis offers a new, long-term vision for Europe. The massive influx of migrants and refugees will require a huge effort in preparing European citizens for a societal change not seen in recent history. But the potential benefits, Heuser argues, could be equally astounding. 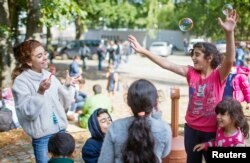 Children of migrants play with soap bubbles after arriving at a new emergency shelter in a sports hall near the Olympiastadion in Berlin, Germany, Sept. 10, 2015.